Gluten free buckwheat noodles slathered in garlicky sauce for an easy dinner! 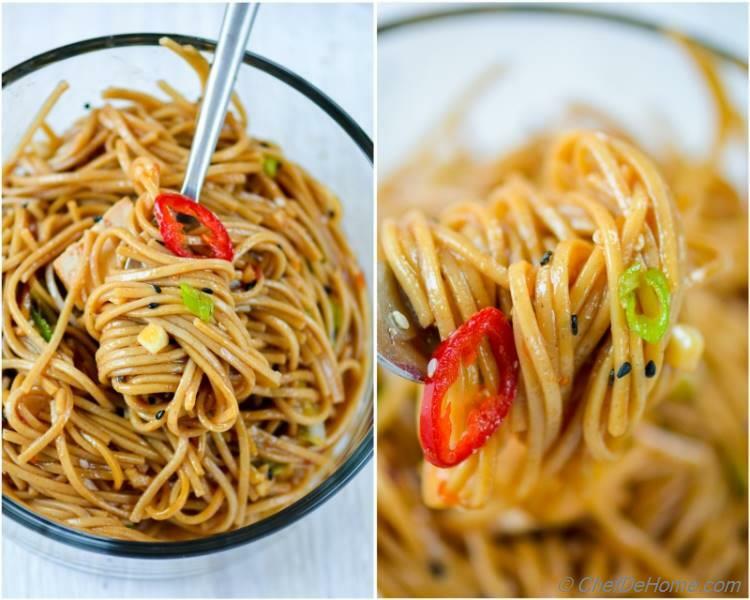 These Sesame Chili-Garlic Noodles are gluten free, meatless, spicy, garlicky, and umami! Perfect for weekday dinner or hearty lunch, they're are quick and easy, and made with simple Asian ingredients! Oh - and they are served with grilled tofu. Because it wouldn’t be a complete meal without some protein! I'm a huge fan of Buckwheat Soba Noodles. Whenever I'm in mood of Asian inspired cooking, I always reach for Buckwheat noodles instead of regular wheat or rice noodles. Trust me, even a big bowl full of these noodles will not leave you heavy or lethargic. Since gluten free, buckwheat noodles are extremely lite on stomach and you know, they just cook in 4 minutes!! 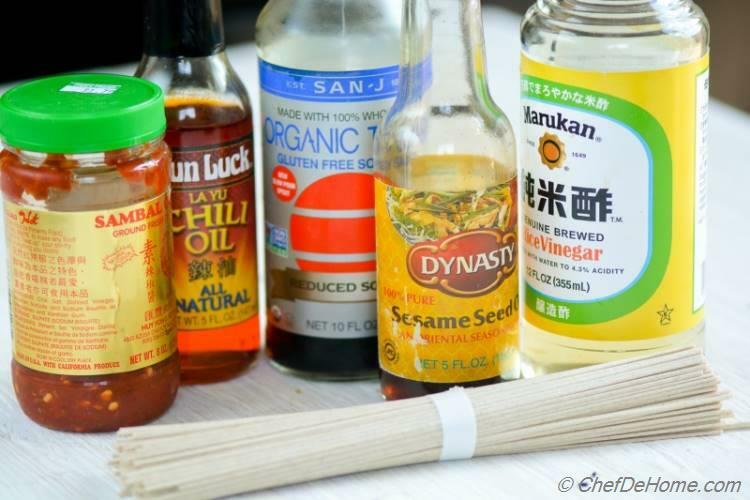 If you like Asian cooking, you will already have these ingredients in your pantry. Some rice vinegar, soy sauce, chili pasta, and sesame oil. A few ingredients that do magic together! In my honest opinion, once you have ingredients, it takes less time to cook this meal at home than to order a takeout and wait for pickup/delivery!! For such situations, a 20 minute meal, like this, is my saving grace! I already made chili-garlic sauce and refrigerated in morning. In the evening, by the time, Vishal grilled some tofu, I boiled buckwheat noodles and just in 10 minutes we were eating dinner! Seriously, if I had to place an order, and wait for delivery, it would have taken no-less-than 25 minutes, at the minimum!! Don't you think?! So, for such busy days, even on weekdays, this kind of meals are my favorite. The best trick to ensure "no excuses" at last minute. :) I keep sauce and tofu marinated in refrigerator (trust me, it needs 5 minute of your time in morning). Then, cook tofu, buckwheat noodles, and Volia! Dinner is served under 10 minutes!! 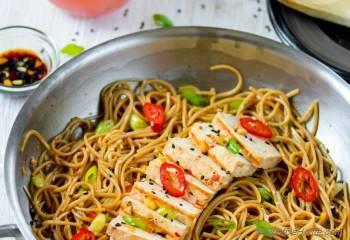 PS: If you sear the tofu instead of grilling, this chili-garlic noodle skillet is also an one-skillet meal! So, mush more easy cleanup!! Instead, you enjoying homemade gluten free buckwheat noodles, with hearty serving of Organic Tofu and a basic chili-garlic sauce which is NOT heavy on soy and oil. 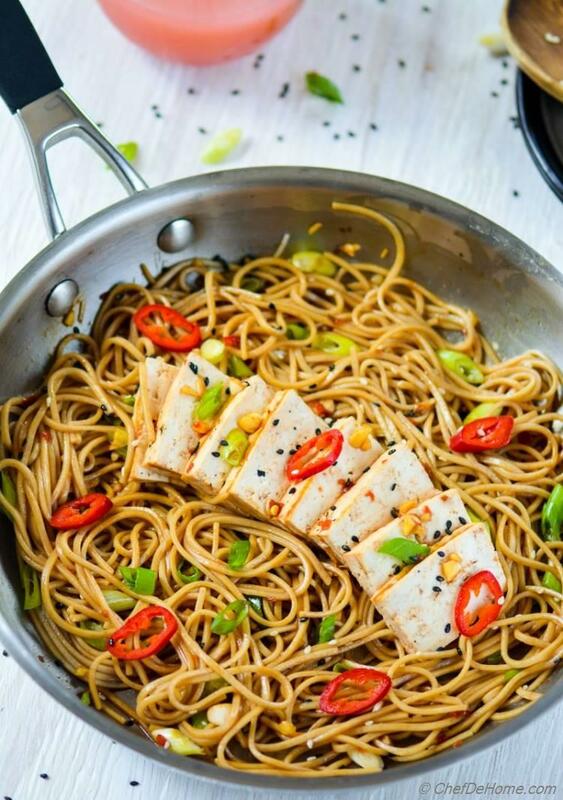 PS: You can even make these noodles vegan! Just replace Sambal chili paste with a regular vegan chili-garlic paste or use chili flakes instead. So, once after watching her show, I sat down and figured out best proportion of ingredients which work best for my palate! Since then I have this "Pet Recipe" which works great for salad dressings to marinades. This is why I even marinated Tofu in same dressing. This dressing also works great for chicken. Vinegar helps tenderize the meat and soy, garlic, sesame oil adds scrumptious flavor. Just print a card and keep on refrigerator! You will never have to run to store for a last-minute grill marinate!! Look at these noodles! Drool-licious!! Aren't they? 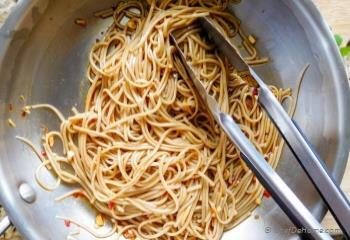 Mild heat of chili, umami soy, subtle bite of vinegar, with hint of garlic and green onion in every bite makes this noodles a comforting and delicious meal! Oh! and don't forget the tofu, that's what giving you a serving of protein. You can also bring some crunchy vegetables to the party to make meal more substantial.....but, for the record, I don't like when my Asian noodles have ton of veggies and very less noodles. You know what I mean? Like when you order in a Thai or Chinese Restaurant and they will add load of veggies in every noodle bowl! Every bite, you just chewy veggies and hardly taste noodles! No offence, I love my veggies, but it has to be balanced! 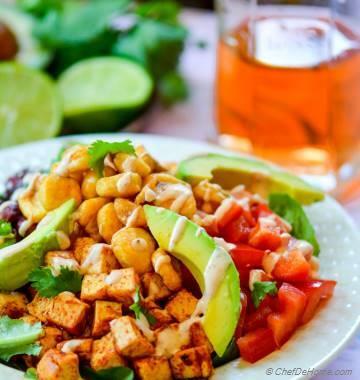 Smart Swap If not vegetarian, replace Tofu with (lean animal protein) - poultry (Turkey) or fish (Salmon). 1. Slice scallions and garlic. 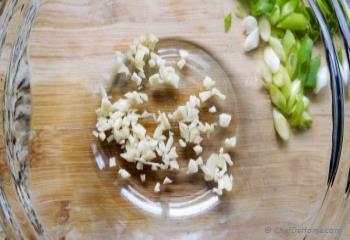 Add all garlic in a small sauce bowl and set scallions aside. Also, press tofu in paper towel to dry out extra water. 2. 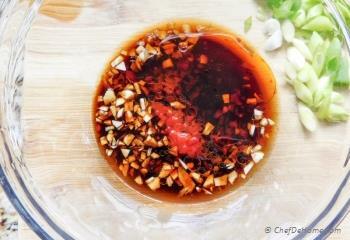 To make sesame chili garlic dressing, add soy sauce, sambal chili pasta, rice vinegar, chili oil, sesame oil into garlic. Whisk well, then taste and adjust salt. 3. Set outdoor grill or grill pan to preheat. In bowl, add 3 tbsp of marinade and add drained tofu. 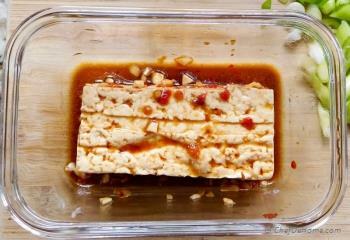 Coat to cover tofu in marinade and set aside for 5-10 minutes while you cook noodles. 6. 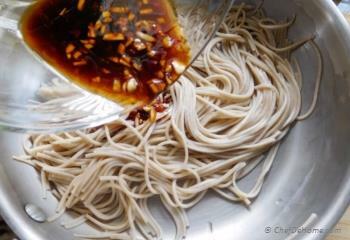 Drain water and return soba noodles back to pan, add remaining sesame chili garlic dressing onto hot noodles. 7. Toss well to coat noodles in the dressing. 8. Toss in half of scallions(green onions) and transfer to serving platter. 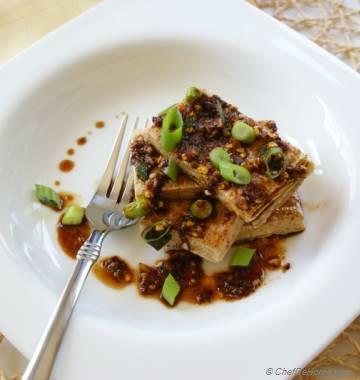 Add sliced cooked tofu, garnish with sesame seeds, sliced chili pepper(if using) and remaining scallions. Serve hot and enjoy! Vegan?This dinner can be made vegan. Just don't use Sambal paste as it has fish paste in it. Instead, use a fish-free chili paste or 1/4 tsp chili flakes. 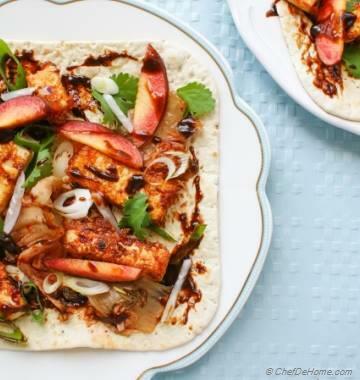 Make Ahead: Make sauce at night and also marinate tofu overnight. 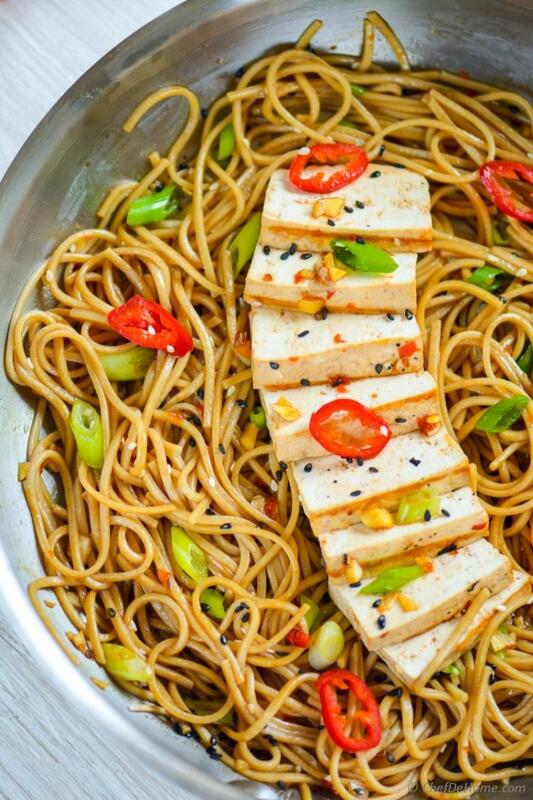 Just cook noodles and tofu in morning, toss in sauce and pack for lunch! SERIOUSLY drooling over this right now! This is absolutely going on my list. :) Annie, thanks! I hope you like it when you try. 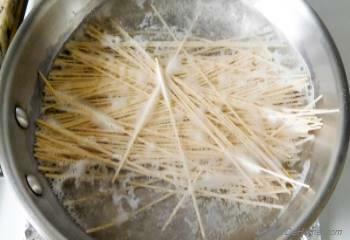 Delicious noodles... I am so drooling right now!! Shubha, thanks for kind words. I appreciate it! thanks, Cyndi. I totally believe you! Even I started eating tofu as a healthier protein replacement to Indian Cottage Cheese i.e. Paneer which is very common in Indian cooking. Since then, I can never have it enough! I'm sure you will like it too. Do try sometime! Kushi, thanks for kind words, my friend. 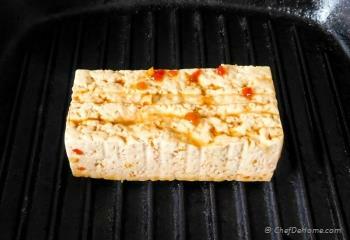 Hmmm...I've grilled a lot of things, but I have to admit have never grilled tofu before. But this looks incredible! I totally need to give this recipe a shot. My wife LOVES Asian food, so I know she would go nuts over this one, too! thanks, David! I'm telling you will LOVE grilled tofu. Do give it a try! I hope to hear some feedback! I love the sound of this dish, Savita! I've never grilled tofu before, but it sounds delicious! Especially with those garlic noodles...yum! Gayle, thanks! I know! garlic and chili makes everything delicious, isn't it ? You must try grilled tofu sometime, it tastes really good. Also, great options for vegetarians. 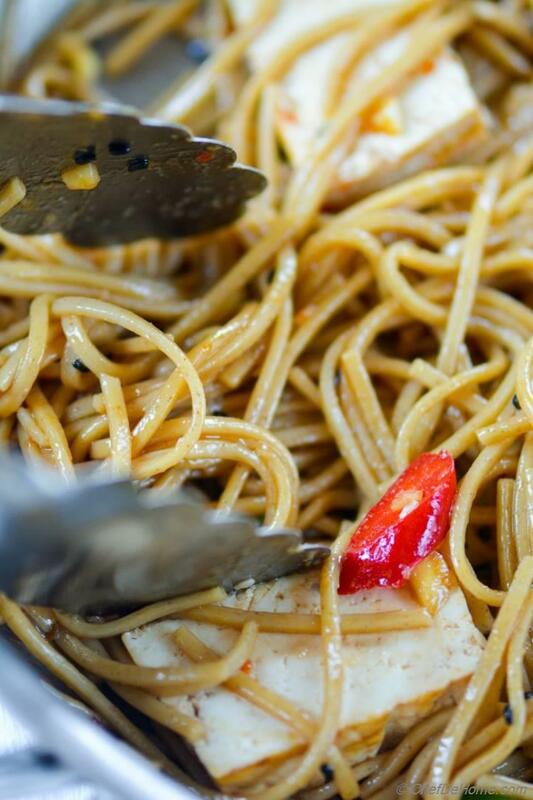 I love the look of these noodles Savita! have to try soba noodles, been hearing so much about them! 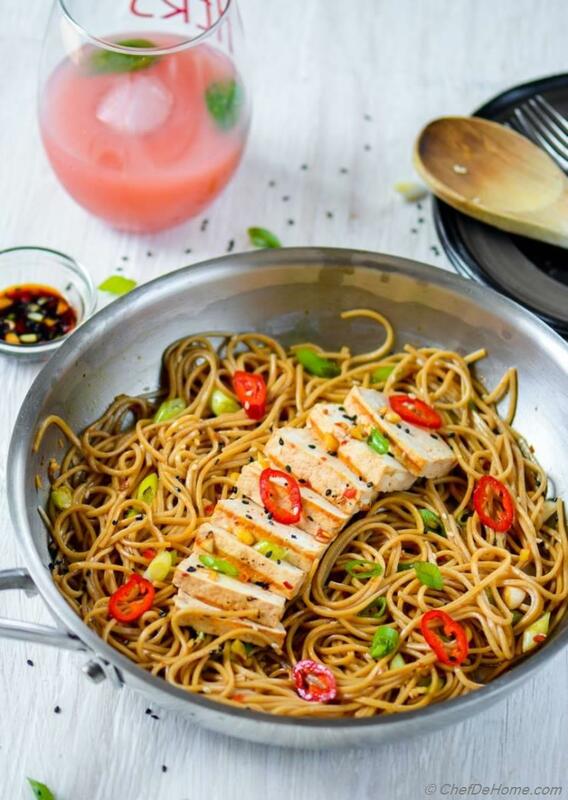 I'm sure you gonna love Soba Noodles! You must try, Manali! You can spot these in Asian Food isles of most stores. Sathya, thanks my friend. Buckwheat Soba noodles are easily available in Asian Food Stores or even in Asian Food Isles of most stores. I'm sure you will love'em. A delicious protein packed meal. 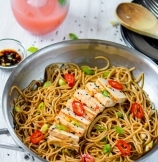 I love noodle dishes, and I like tofu but I need more tofu recipes to try. This one will be next! :) Thanks, Dannii! I hope you like it when you try.